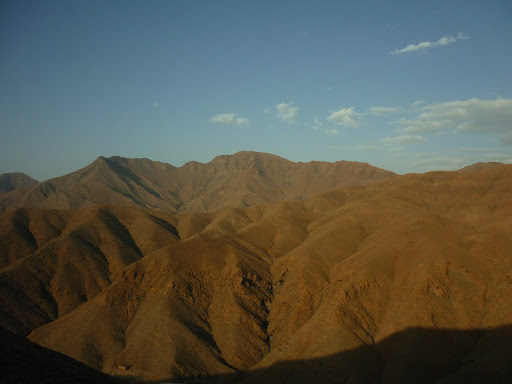 The next morning I woke up at 6:30am to get ready for the bus ride to Ouarzazate. 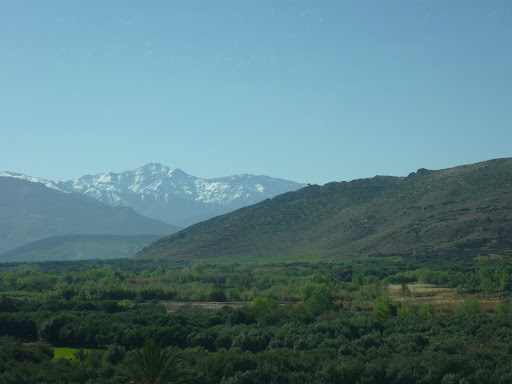 Once we got to Ouarzazate we were to head to the Oasis of Fint. I didn’t know anything about Ouarzazate or Fint beforehand except what I read on Google and Wikipedia. I learned that Ouarzazate was the scene of several Hollywood movies and it is literally the doorway to the desert. When I think of the desert, I think of sand dunes, sand storms, camels, barrenness, and mirages. When I think of an Oasis, I think of a lush area with water that is full of life. What I didn’t know was that the doorway to the desert was literally a terrifying climb through the mountains with little water. I was eager to catch the Supra Tours coach to Ouarzazate. While Supra Tours isn’t the top of the line as far as buses, it is much better than the coach we took to Essaouira. Once we were able to board the bus, we both breathed a sigh of relief. The bus was super clean, modern, and had air conditioning. Also, the bus was not full and we had several options for seating. As my companion did what he did best, slept, I jumped from seat to seat on the bus capturing pictures of the scenery. I was in utter amazement at the beautiful scenery. For the first hour of the bus ride, the roads were normal, straight highways. Then, we began our ascent into the mountains. The highways turned into narrow lanes, twists and turns, and in some instances there were no guard rails. In Marrakech and Casablanca, I was certain that I would meet my fate by one of the speeding motorists or by smoke inhalation. On the journey to Ouarzazate, I thought I would meet my fate by tumbling over the side of the mountain in the coach. The bus stopped half-way into the trip (2 hours) at a very nice café and gift shop. There was an English toilet with an attendant, toilet paper, water and soap to wash my hands; all things very necessary (in my opinion) for any bathroom. After another two hours, we finally reached our destination, Ouarzazate. The bus dumped us off in a relatively unassuming location. “This could not be the town”, I thought to myself. We did pass the Atlas Film Studios just before coming to town, but once in town, there was nothing there. I likened this experience to that of an old cowboy movie where there is nothing but tumbleweeds blowing around on the ground. It was close to 2:00pm on a Monday afternoon. Most of the stores were closed, very few people were on the streets, there were also few cars traveling on the roads. As we walked through town looking for something to eat, we came across someone whom JB CouchSurfed with several years ago. Before we could get a chance to decide what we were going to eat, we were whisked off to a café by his friend. After eating an average meal, we continued our walk through the town. We headed to the main tourist attractions which held a small market, a cinema museum (which was closed), and the Kasbah. After the long walk in the heat carrying my backpack, I was no longer in the mood to ‘tour.’ I didn’t go into the famed Kasbah. Instead, we opted to go to our final destination, Fint. After some disagreeing, we finally caught a cab toward Fint. Fint is 10KM outside of Ouarzazate. The road was paved for about the first 2KM. Thereafter, we rode through rough terrain of gravel. The taxi came to a stop in what seemed like the middle of nowhere. We collected our things from the boot and took off on foot through the ‘oasis’. In order to pack light, I only carried ballet shoes and flip flops with me to Morocco. I was not prepared for mountain climbing or excursions in the oasis. Our walk to the hotel consisted of walking on dirt roads, through brush, and across streams of water where I had to balance myself walking across rocks and sand bags. I complained and cursed the whole way. As a child I played in streams and made mud pies. I’m not adverse to such things. However, I wasn’t prepared and once thrown out of my comfort zone I completely shut down. As we crossed the streams of water, we passed Berber women washing their clothes by hand in the river. As my stepfather said when he saw the pictures “we think we have it hard over here”. 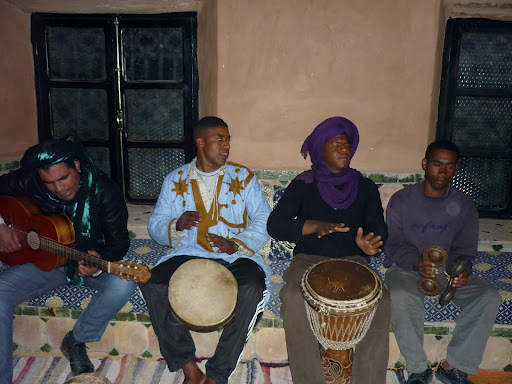 The one thing I noticed about Ouarzazate and Fint different from the other three cities I visited in Morocco was that there was a much different make-up of the population. In the other cities, I didn’t see as many Africans of non-Arab descent. 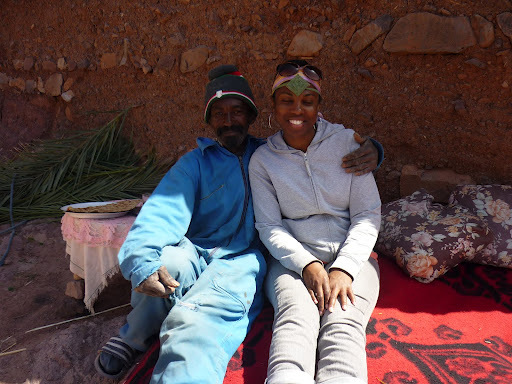 In Ouarzazate and Fint, I saw much more darker-skin tones or people who looked like me. I felt that I was really amongst my people. Finally, we reached our destination, the Hotel La Terrasse des Delices. I read several reviews about it online and all the reviews indicated how lovely the place was, the amazing views, and the hospitality of the management and staff. As JB has brought several tourists to the establishment, he has built a relationship with the owner and for JB it was like visiting family. Therefore, I felt like I was visiting family rather than visiting strangers. The hotel was absolutely charming and sits in what I would describe as a basin or valley, but on a hill overlooking part of the oasis. We were greeted by the owner, Rashid, settled into our room, and partook of the traditional mint tea. I immediately took a shower and rested until it was time for dinner. There were four other people staying as well. So, for the most part, we had the hotel to ourselves. For dinner, we were treated to a tagine of fresh vegetables and chicken, soup, a lot of bread, and some type of omelette. Once we finished dinner, we were entertained by some live music from the staff. In the hotel, we had no television, no wifi and no cell phone connection, there were no cars whizzing by and no horns honking. Through the quiet surroundings I was able to hear the frogs croaking and though the clear skies JB and I looked up into the sky and tried to make out the different stars. It was the first time I had gazed at stars in ages and it was a truly magnificent site. The hotel was all inclusive meaning we were served three meals a day. Breakfast consisted of a lot of bread and crepes with honey, jams, juice, tea/coffee. I really wanted sausage and eggs, but I enjoyed my meal sitting out on the terrace under the warm sun. I didn’t think it was that hot or the sun was that intense, but upon arrival to the United States immediately after my trip, my parents have let me know on several occasions how dark I got. After breakfast, we walked around the village. I will be honest, I complained and cursed a lot as well and I didn’t really enjoy it. In the middle of my temper tantrums, JB patiently and happily showed me the carrots the residents had planted as well as the wheat fields and pointed out other plants and trees natural to that environment. We walked through the dirt, mud, and streams again. We also climbed up and down hills. We greeted the residents as they passed by and conversed with some small children along the way. Finally we found ourselves at the home of Ahmed and his wife Khadija. Ahmed makes baskets for a living. At the time we met him, he was making baskets that would be used for lamp shades in hotels. I really wish I had room in my luggage or else I would have purchased the entire lot of lamp shades. He told us jokes in Berber (which JB translated for me) and we talked about his family. He was only 52, but looked much older. He said that although he wanted more wives one wife tired him out enough (which was also the reason for his greying hair and his old looks). He and his wife insisted we have tea. So, we had tea in one of their salons. I am always hesitant about eating food from other people, but I drank the tea, ate the dates, and the bread. Afterwards, we bid our host goodbye and promised to return in the evening to taste his honey. We returned to the hotel for lunch on the terrace. Thereafter, I was able to read some of my book, Midnights Children, and catch up on some writing. JB went to sleep (as usual). After baking in the sun, I grew tired and decided that I too needed a nap. After a short rest, we headed back to Ahmed’s house. He escorted us to another part of the house where there was television with cable. We watched television for a while, but Ahmed never returned. We decided to head out before the sun set as I was too scared to walk back to the hotel in the dark. Before we could leave, we were met by his wife. She offered us tea again and we couldn’t refuse. Finally, belly extremely full, we bid our hostess goodbye and headed back to the hotel for dinner. We were the only guests staying for dinner and there was no music that night, but JB and I didn’t mind as we talked about Khalil Gibran, Mamoud Darwish, Naja Ali, Ghassan Kanafani and Moroccan Politics. I was definitely in my element. Eventually Rashid, the owner, joined us and we talked about the economy and how it has affected his business. Business was in fact slow, but he was confident that it would pick up. I wasn’t sure how old Rashid was but I didn’t hesitate to ask him if he was married. He is not. So any single ladies interested in meeting a handsome entrepreneur, make sure you make a trip to Morocco and visit Rashid. I can also say that most of the men I saw in Fint were handsome! I left the men to chat whilst I prepared for bed. Getting back to Ouarzazate was not as simple as standing out on the corner and waiving down a taxi. We were in the middle of nowhere. JB indicated that he had arranged a ride for us, but we waited and waited and no ride. Eventually we set off on foot to a school (the drop-off and pick-up point) and waited. Still…No car. I was hot, tired, and annoyed. I was also afraid that I was going to miss the bus out of Ouarzazate and ultimately my plane from Morocco the following day. Men passed us riding donkeys and I really debated hitching a donkey ride 10K into the city. After some time, I also debated making the 10K walk. While we waited, two cars passed us going in the opposite direction. After some time, JB headed back to the hotel whilst I waited on the side of the road. During that time, a couple passed indicating that they were headed back into town and that I could go back with them. While I wanted to attach a note to his bag and go with the couple, I thought I should not be selfish considering all that he done for me since my arrival to Morocco. Finally JB came with a car. I hopped into the car and we made the journey back into town where we booked our return ticket. We had some time before the bus came. We walked around the town in search for an ATM machine as I was low on cash. We also sat down at a café so JB could get something to eat, but I needed to use the bathroom and was in no mood to eat or drink before a four hour bus ride. Finding only a Turkish toilet in the first café, I decided to go to a different place. In the next cafe, they told us they had an English toilet. There was no English toilet and no washbasin. Although I was briefly debriefed on how to use the toilets, I wasn’t given a proper lesson in Turkish toilets. After the 3rd attempt at unsuccessfully finding an English toilet, I gave up and had to be creative. I won’t get into details, but let’s just say I was happy that I traveled with plenty of plastic bags, hand sanitizer, and tissues. Finally the bus came and I was less impressed with this bus than the one we arrived in. Since Ouarzazate was not the first stop, the bus was already full, loud, and smelly. People ate on the bus and the only way to describe the smell is to imagine someone opening a can of sardines on a crowded elevator. Just our luck, we managed to get a loud pair of men behind us who laughed hysterically for the first ½ hour of the trip. I swear that they were trying to beat each other in the contest for the craziest laugh. After sometime, the laughing stopped and was replaced by a retching noise as the man directly behind me vomited every so often until the bus came to its midway stop. I was disappointed when we passed the nice rest stop we stopped at on the way there. Once I saw the café disappear from the back of the bus, I knew that we were going to stop at a less than par rest stop and I was right. I begrudgingly got off the bus and headed towards the Turkish toilet. The Turkish toilet was my fate and I had no choice but to deal with it. I grabbed some Pringles and chocolate and boarded the bus again. As the sun began to set, I was even more afraid of our ascent into the mountain than before. My thoughts went beyond tumbling down the side of the mountains to how long would it take rescuers to reach the bus if the bus went off the road and how many times the bus would roll before it came to a halt at the bottom of the mountain. Eventually, I used my breathing techniques my doctor suggested for flying (basically counting) until it became too dark to see my impending doom. Finally we pulled into Marrakech and I was not only happy to be leaving the bus, but also happy that this was my last night in Morocco. I love traveling, but I was growing tired and craving for home and a bed that I could recognize.After checking into my hotel, I grabbed some dinner in Gueliz. I really wanted to have a nice night on the town, but I was in no mood and really annoyed with my much younger travel companion. I barely said anything to him on the entire last day and once we returned from Ouarzazate, we argued before bidding each other farewell. The next day I headed to the airport and took the short flight back to Spain. And that is how my Moroccan adventure ended my friends. I will note that JB and I are on speaking terms and plan to keep in touch. I hope!